To ensure that Steam branding and trademarks are used consistently across all marketing and communication materials, we have some guidelines that should be followed by all partners when using Steam branding. The Steam logo may not be used in any manner that might imply that any non-Valve materials are sponsored, endorsed, licensed by, or affiliated with Valve. The Steam trademarks may not be displayed as primary or prominent features on any non-Valve materials. Use only approved Valve artwork for the logo. The Logo must stand alone and may not be combined with any object, including but not limited to other logos, words, graphics, photos, slogans, numbers, design features, or symbols. Valve reserves the right, in its sole discretion, to modify guidelines regarding the Steam trademark, and may request that third parties modify or delete any use of the Logo that, in Valve's sole judgment, does not comply with these guidelines or might otherwise impair Valve's rights in the Steam trademark. Valve further reserves the right to object to unfair uses or misuse of its trademarks or other violations of applicable laws. Valve also reserves the right to approve any communication using the Steam brand before its distribution. You must include the following language on the packaging of any product requiring user to activate the product on Steam. This language must be prominently displayed on a background color that is different from the primary color of the packaging. For example if the packaging is primarily black the language must be displayed on a background color significantly different than black. REQUIRES INTERNET CONNECTION AND FREE STEAM ACCOUNT TO ACTIVATE. Notice: Product offered subject to your acceptance of the Steam Subscriber Agreement ("SSA"). You must activate this product via the Internet by registering for a Steam account and accepting the SSA. Please see https://store.steampowered.com/subscriber_agreement/ to view the SSA prior to purchase. If you do not agree with the provisions of the SSA, you should return this game unopened to your retailer in accordance with their return policy. 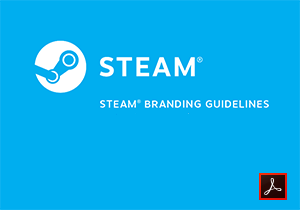 Click Here to download Steam Branding Guidelines documentation and logos for Steam, Steam Machines and SteamVR. Clearly describe the current state of your game. For more information on Steam Early Access and for all rules governing your use of Steam Early Access, please see: Steam Early Access Documentation. You are welcome to use Steam Workshop branding when promoting your Workshop. Click here to download Workshop branding assets.